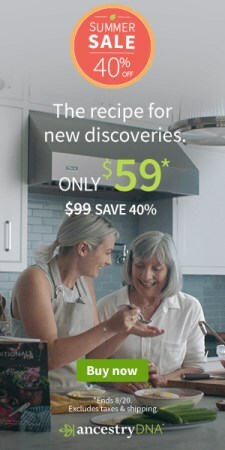 AncestryDNA's Summer Sale brings a whopping 40% discount on the company's dna test. The sale price of US$59 (down from $99) excludes taxes and shipping. To take advantage of the discount offer, order your kit before 11:59pm on Monday 20 August. UPDATE, 13 August: 25% discount offer for researchers in Ireland and UK.